Oooh, Shinies! 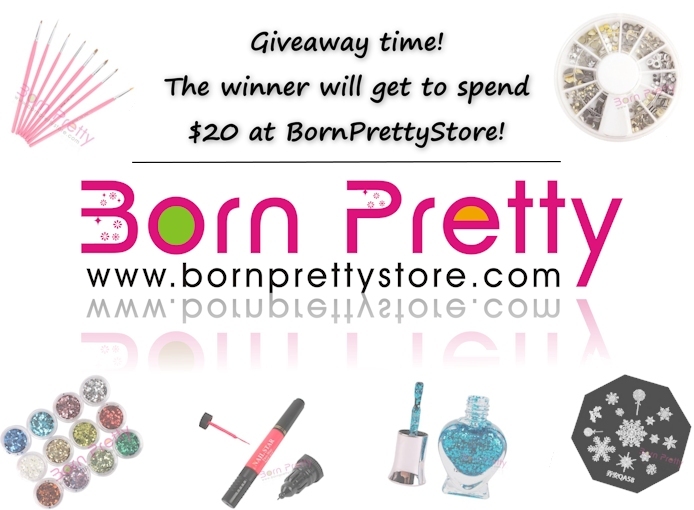 : Giveaway: $20 to spend at BornPrettyStore! Giveaway: $20 to spend at BornPrettyStore! Thanks to the lovely people at BornPrettyStore, I'm holding a giveaway where 1 person will win item(s) of choice worth $20 from BornPrettyStore! - The giveaway is open internationally. - There will be one winner. - The winner will be contacted within 24 hours after the giveaway closes, and then has 48 hours to reply. - After the winner has replied, I will send the winner's contact information to BornPrettyStore, who will take it from there. - BornPrettyStore will ship the chosen item(s) worth $20 directly to the winner. - You can only enter by using the Rafflecopter widget below, entries in comments do not count. - Please note, with Google Friend Connect I mean the following option on the right bar of my blog, not on Google+ (I don't use G+).